The dog days have summer have arrived – and there’s nothing like sitting in the shade sipping lemonade on a hot summer day. I usually make lemonade using just lemons, water, and sugar – but when I saw a hundred-year-old recipe which suggested that back then they colored pink lemonade by mixing in a little red-colored jelly (currant, crab apple, etc. ), I just had to give it a try. According to the old recipe, the best lemonade is “a little too sweet, and a little too sour.” Using that criteria, the Pink Lemonade I made was perfect. It was refreshing and delightful . . . and a lovely shade of pink. Put the sugar and 2 cups of water into a saucepan using medium heat, bring to a boil. Reduce heat, and continue to boil slowly for 3 minutes. Remove from heat, and cool slightly then beat in the jelly. (I used homemade Crab Apple Jelly, but Currant Jelly or any other tart red jelly would work well). There may be flecks of jelly in the liquid even after beating, that’s okay. Squeeze lemons, and stir lemon juice into the sugar mixture. Strain the liquid. Some of the jelly (as well as the lemon pulp) will not go through the strainer. Discard this jelly, it will have already colored the lemonade. Chill the strained syrup. To serve, mix the syrup with 6 cups water, and serve over ice. If desired, garnish with mint sprigs or lemon zest. The syrup will keep for several days in the refrigerator. 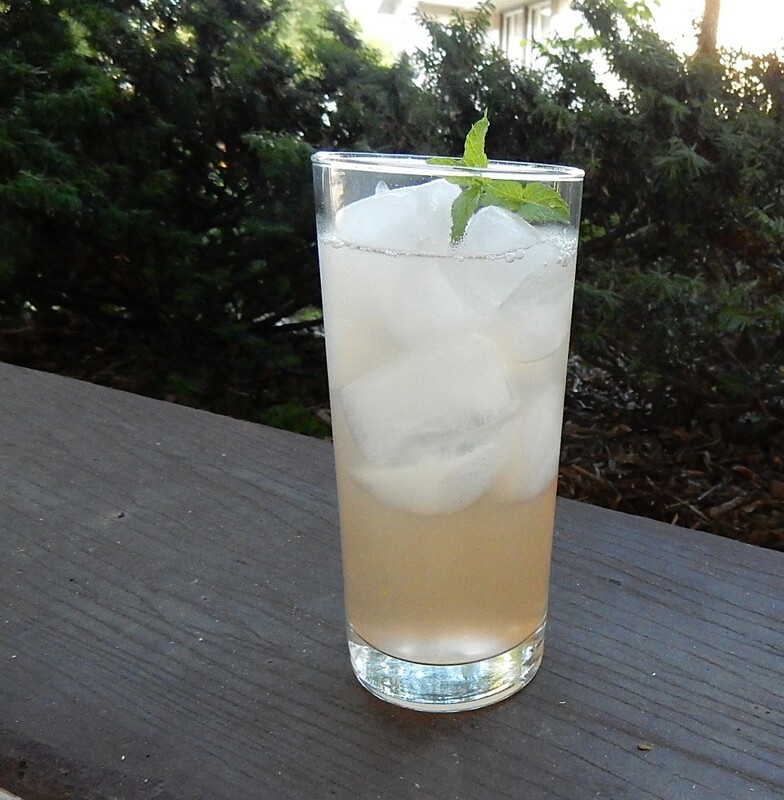 Individual servings of lemonade can be made by mixing some of the syrup with water in a glass – proportions can vary to taste. The old recipe called for 3 lemons. When I made this recipe, 3 didn’t seem like enough; so I doubled it and used 6 lemons. Posted on August 8, 2016 August 7, 2016 by SherylPosted in FoodTagged lemonade, recipe. A drink which has stood the test of time……. I love home made lemonade. I do love a good lemonade, but I’ve never been able to replicate the sweet/sour taste of Grandma’s. Now, I’m thinking it may have been that she used a syrup. I’m going to give this a try — both plain and pink. I woke up to a heat advisory this morning (predictions for 98/113!) so a nice lemonade will be perfect. Just the thing for the grandkids. Can’t wait to try it! Agree completely with more lemons rather than less. I like the new twist on the old faithful drink! 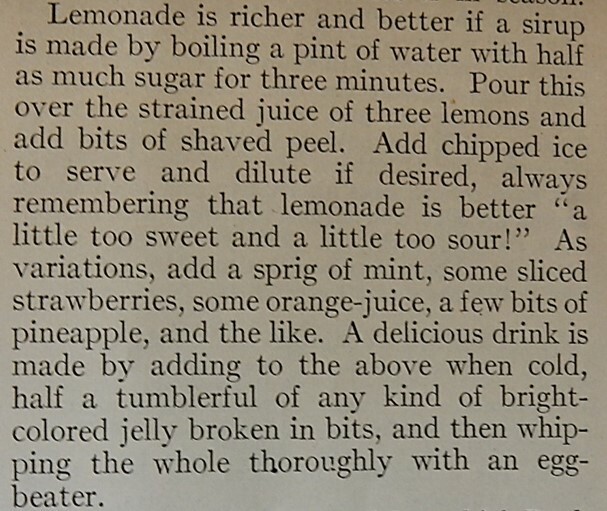 I had never heard of using jelly in lemonade. A great idea. I’ve always wondered how lemonade got pink. Thanks. Can you just imagine families in 1916 sitting under oak trees drinking this? How fun. Sitting on the front porch sipping that homemade lemonade is the picture in my mind, 🙂 How did we forget to add red jelly for color? This looks like summertime in a glass! Yummy! Sounds delicious for a hot summer day, thanks! Thankfully, some things are timeless! This sounds wonderful! And what a yummy drink this really is! Mmmmmm, it looks refreshing too! Homemade simple syrup is key, I think. Anything else probably has corn syrup in it. What an inspired touch the redcurrant jelly is!